No one wants Chinese food on the Fourth of July, I say. We're in apple-pie America, and my parents are cooking chow mein! . . . They just don't get it. Americans do not eat Chinese food on the Fourth of July. Right? 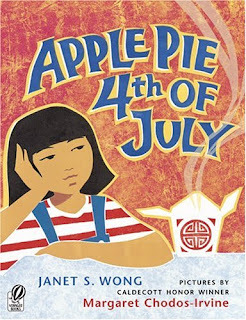 Shocked that her parents are cooking Chinese food to sell in the family store on this all-American holiday, a feisty Chinese-American girl tries to tell her mother and father how things really are. But as the parade passes by and fireworks light the sky, she learns a lesson of her own. This award-winning author-illustrator team returns with a lighthearted look at the very American experience of mixed cultures. I stumbled upon this book while looking for multicultural books to feature at the library for the summer reading program. It's so adorable! The main character is the daughter of two Chinese immigrants who own a Chinese restaurant, and she can't understand why they are cooking up such a storm on the Fourth of July. I don't want to say too much more about the plot, because it would give it all away. However, I love that this book is about immigrants and a first-generation child, because that truly reflects the American experience.